A highly anticipated game of rugby, which based on previous performances, suggested would be a hard fought, physical contest and the billing didn't disappoint! Newton Abbott started the brighter of the two teams and controlled phase play and field possession for the first 10 minutes of the game. Topsham were able to soak up a constant onslaught of phased, close quarter rugby, with the visitors focusing on a pick and go approach and physicality at the ruck. 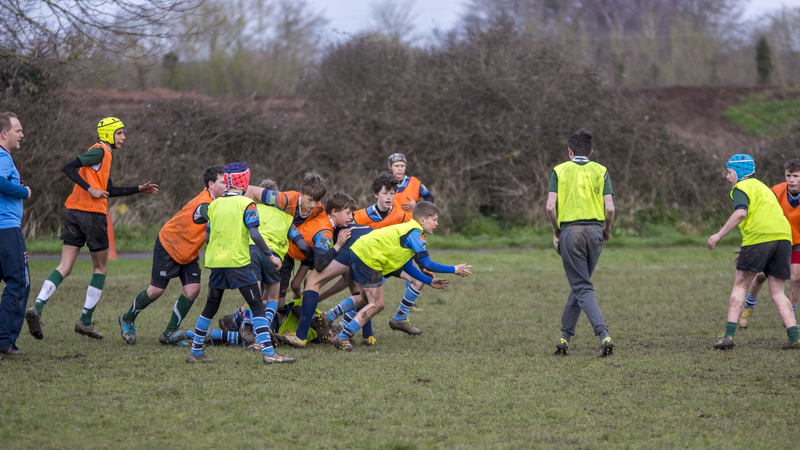 Topsham's defensive effort has become somewhat of a strength this season and to the player, there was no lack of commitment in the tackle - great to see Austin, Tom P, Harry and Sam R tackling some very large opposition! Newton Abbott began moving the ball and had some impressive hard running backs out wide, who after sustained pressure were able to score the first try the match through their right wing, after the touch judge had deemed an earlier Topsham try to be disallowed due to hands in the ruck. As with so many of the Topsham games, the team takes a while to get into it's full stride, but interestingly the difference this season, is the players are adopting a controlled approach to their game play and are now able to take opportunities when they are presented, rather than trying to force the final pass and are comfortable dealing with initial pressure from the opposition. Disciplined, controlled rugby is also now developing into a game plan with purpose and structure, which is a pleasure to watch. Topsham began to up the anti as the game progressed and after quick ruck ball from the forwards, Freddie span the ball wide to Will, who broke the first line of attack and off-loaded to Harrison who scored a well worked try - Toby converted the 2 points. Topsham continued to move the ball and off-load out of the tackle throughout the first half and eventually a lineout in the opposition 22, resulted in Hamish F peeling blind off the back of the resultant maul and scoring in the corner. The pace of recycling quickened as the game progressed and the Topsham forwards began to produce fast ball for the back-line to exploit space in the wider channels, with 2 tries from Toby and a further try for Harrison, Hamish F converted one of these tries. Special mention to Noah, Hamish F, Hamish B, Henry in the forward pack for huge efforts throughout the game, against a large opposition pack. Despite many positives from the game, the best part, from a sheer courage perspective, was when Topsham were camped on their own try line for over 5 minutes of sustained pick and go rugby from Newton Abbott, but through dogged determination were able to keep the opposition forward pack from scoring and instead turned the ball over and ended up scoring at the opposite end of the pitch. This period of play spoke volumes about this squad of Topsham players. An excellent game of rugby, played in good competitive spirit. 1) Breakdown area - supporting the ball carrier quicker at the ruck. 2) Line speed in defence - we must be faster. Final Score - 29 - 12.